Berkshire Smoked Ham for sale. Buy online at Zingerman's Mail Order. Gourmet Gifts. Food Gifts. Heritage breed country ham from Sam Edwards. 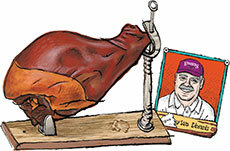 Berkshire hogs are a heritage breed pig renowned for their full flavor. When third-generation ham curer extraordinaire Sam Edwards started using them instead of his standard pig stock, the results blew him away. The thin slices of ham, eaten like Italian prosciutto or Spanish jamón serrano, are richer and more flavorful, with a melt in your mouth texture usually found only in the best European hams. The hams are dry cured and hickory smoked. We offer two formats: pre-sliced thin like prosciutto (aged fourteen months) and whole in the form of an epic 800 day ham that's aged over two years. It comes bone in (no hoof at the moment though) and, in my opinion, is as great as American country ham gets. Serve the ham as is, at room temperature, with a handful of Virginia Peanuts. Whole hams are simply wrapped and last for many months. Ships at ambient temperature, store below 70 degrees, ideally between 40 and 60 degrees.